Home / Balakrishna / Movie News / Nagarjuna / Reason Behind Balakrishna-Nagarjuna's Cold War? 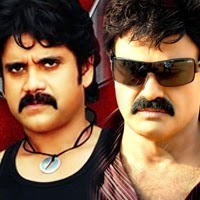 Reason Behind Balakrishna-Nagarjuna's Cold War? Actors Nandamuri Balakrishna and Nagarjuna are not in talking terms for the last one year. They're avoiding each other and haven't come face to face even at any function. It's common knowledge that there is a cold war between both Akkineni and Nandamuri famlies. As we dig into details, we got to know that it all started during T Subbarami Reddy's function to honour ANR but the invitees on the invitation card didn't have Balayya's name and picture. This naturally didn't go well with Balakrishna. Akkineni clan which realised the fault in the eleventh hour reprinted a few cards and sent them only to Balakrishna's family. This apparently irked Balakrishna more and he skipped the event. Although Balayya's brother Mohan Krishna attended the do, he was ignored by TSR and Akkineni families as they didn't invite him onto the dais which further fuelled the rift. Although efforts are made by Akkinenis to convince Balayya, they turned futile. After couple of days after the function, none other than Nagarjuna tried to visit Balayya and pacify him for ruining up the things badly. Balayya reportedly instructed his household that Nagarjuna be told that he was not in house and out. Even Nag met Hari Krishna and asked him to resolve but in vain as Balayya didn't budge. Balakrishna was reportedly expecting ANR's call and it didn't happen. Since this, Balayya avoided all Akkineni's functions. Perhaps this is the reason behind Balayya giving ANR's funeral a miss. With these, even Nag reportedly miffed and let out Balakrishna. Let's hope at least these two stars bury their hatchet in the new year and call for truce.